Peter Sprague | Deviation Mode — ON! Big wind folks and it’s in the right direction! I’m writing you, then into the studio for a string session, and then a zip to the ocean to see how the wind looks there. Offshore breeze, grooms the waves to perfection, if nothing more, Cali doing what she does best! And last night, oh my gosh, Peter Bernstein on guitar! 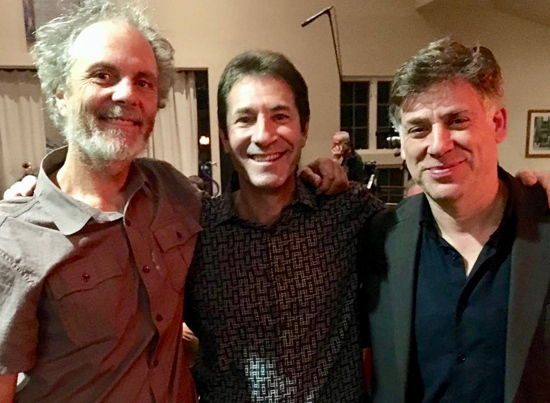 We played a house concert up here close to my house and the sound was supreme and the music coming out, big time jazz guitar with Bernstein at the helm. I loved it and for a long time he’s been one of my touchstones of classic jazz guitar. To mold into his orb, interacting with chord stabs and blankets of harmonics, it was a dream come true for me. Nicest fellow you’d ever meet too — humble down to the core. I’m inspired and renewed and fueled to keep learning and launching out. The Peter git-bros ride again! From the concert last night, that’s Peter B. on the right, sax friend Mark Isbell in the middle and me on the left. What an inspiring musical moment! 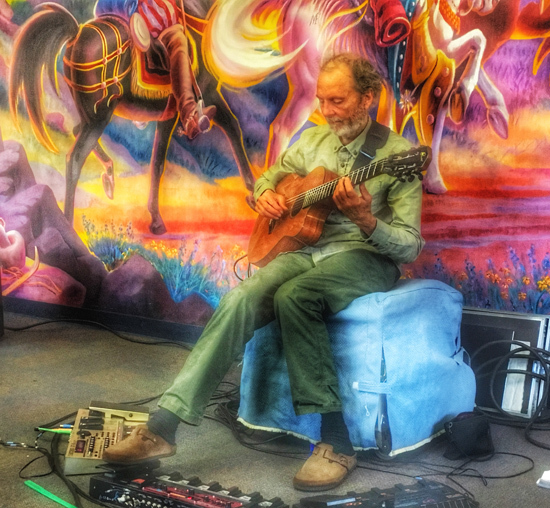 Hey, look at the wild photo that Jill Badonsky took of me at the El Cajon solo guitar concert I played over the weekend. At this moment I think I was playing Lucy in the Sky and with the wild backdrop and the fact that she pushed the colors a little, dude I’m thinking superpsychedelized! Lucy in the Sky in El Cajon! Live music for this week begins tomorrow night at the Oceanside Museum of Art. It’ll be trio time with Tripp on sax and flute, Mack on the bass, and me double neck guitaring it. Have you ever been to one of their concert events? It’s a good setup for music and I’m pretty sure food and drink is included. Look below for the details and hopefully we’ll see you there at 6pm! I couldn’t find a trio photo of me, Tripp, and Mack so this will have to do. 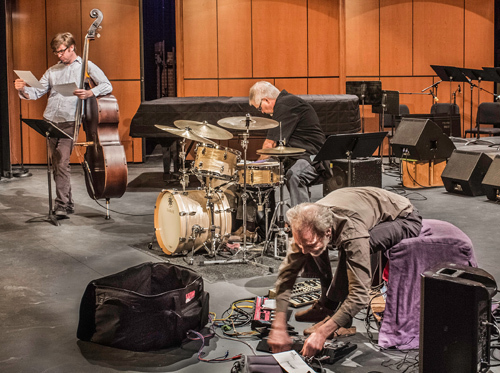 That’s me dealing with gear, Mack on the left looking over the charts, and Duncan adjusting the drums. Men at work! 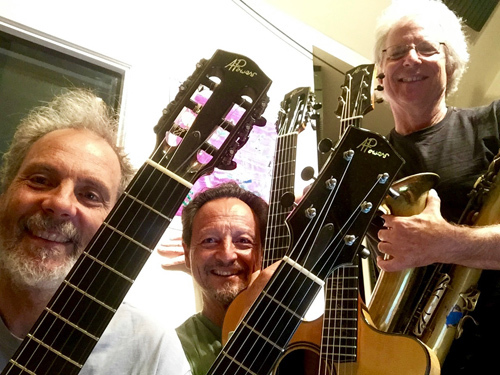 Blurring the Edges, our super group with maestro Fred Benedetti on guitar, Tripp on everything, and me too, the six strings, play a show at Grossmont College on Friday night. We’ve been at it forever and we’ll pull out an inventive setlist and from there go right into deviation mode, meaning improvise our way into new vistas and new planets — occasionally improvising into harmless peril. Chime in good people and together we’ll take over the world! A collage of guitar necks! Every which way! Blurring the Edges with Peter, Fred and Tripp.